Ella Rhodes reports on an innovative longitudinal project. A psychologist will be part of a team working in The Gambia to extend a project that was the first functional imaging study of infants in Africa. The longitudinal project named BRIGHT (BRain Imaging for Global HealTh) and funded by the Bill and Melinda Gates Foundation, will look at whether malnutrition leads to atypical brain development and cognitive changes across the first two years of life. Sarah Lloyd-Fox, a Research Fellow at Birkbeck University of London’s Centre for Brain and Cognitive Development, has spent much of her career optimising an imaging technique, fNIRS (functional near infrared spectroscopy), for the study of infant cognition. Recently her work has turned to the use and transportation of fNIRS into rural communities in the developing world. After a successful pilot project the multidisciplinary group, led by Professor Clare Elwell (UCL, Medical Physics and Biomedical Engineering), Dr Sophie Moore (Cambridge, Human Nutrition Research) and Dr Lloyd-Fox, will now follow 200 children in The Gambia from birth, using fNIRS and a multitude of cognitive tasks. 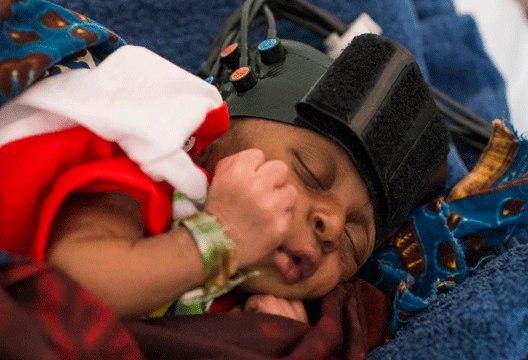 The fNIRS technology to be used in The Gambia, and also on a control group of 50 infants in Cambridge, uses a headband that emits and detects non-invasive near infrared light. This light travels through the skin and skull, but is reflected differently depending on oxygen level, therefore brain activity, in that area. Malnutrition before the age of two can have far-reaching effects, extending into adulthood. Dr Moore said: ‘Nutritional deficiencies in low-income countries impair the growth and development of children and contribute to almost half of all child deaths worldwide’. Of the 200 Gambian infants potentially involved with the study, Lloyd-Fox said up to 20 per cent could be severely malnourished. Therefore in the project they will be able to trace both typical and compromised development in these infants from birth. Brain activity during social cognition, attention and memory tasks will be measured with fNIRS along with functional connectivity to see how well the brain is communicating across regions. The families will also take part in a number of general behavioural cognitive tests and questionnaires to help the research group to understand the interplay between nutrition, brain function and other environmental factors. One of the benefits of fNIRS, Lloyd-Fox said, was that it allowed researchers to measure infant development in an objective manner, and to potentially look more closely at individual differences rather than global effects across groups. She will spend her time between the UK and The Gambia, while researchers at the Medical Research Council International Nutrition Unit in Keneba will carry out testing in the country.